We understand the challenges our customers face in this rapidly changing world, where increased competitive pressure will mean only the most productive will prosper. Increasing the efficiency of load lifting and material handling will be critical to overall productivity. 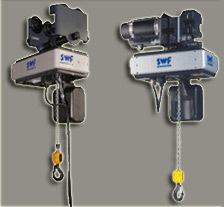 This is why we use perfectly designed SWF, Street and HADEF chain hoists.